A polymictic breccia is a clastic sedimentary rock composed of angular clasts from different origin intermixed in a consolidated matrix. 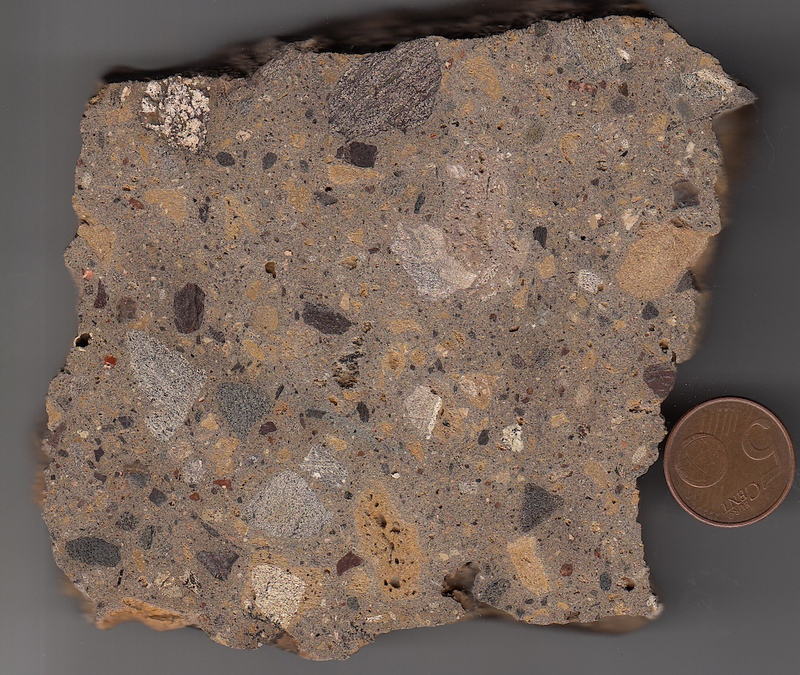 In accordance with common use to avoid genetically related names, the term “polymictic breccia” is applied here purely descriptive only. 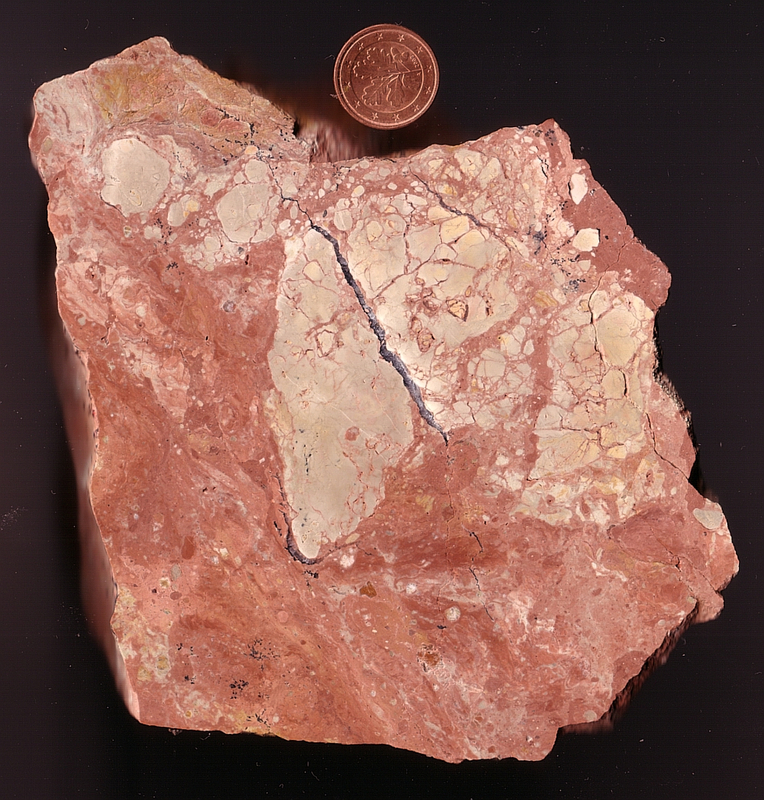 The term “polymictic impact breccia”, a priori genetically related, may be used as a generic term for lithic breccias and suevite breccia . Fig. 1. Polymictic breccia (Onaping Fm. ), Sudbury (Canada) impact structure. Fig. 2. 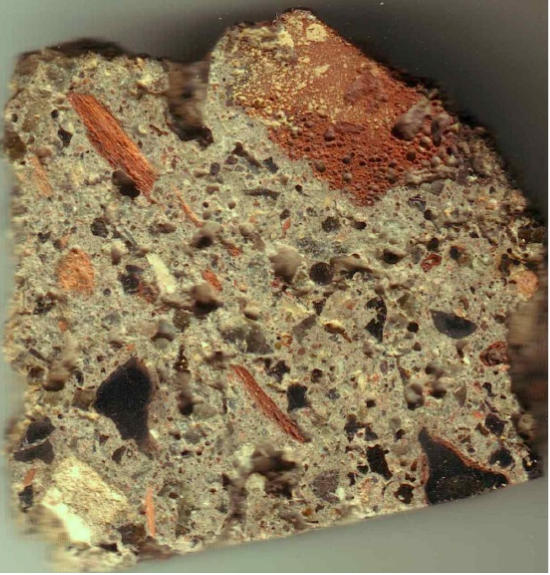 Polymictic impact breccia, polished slice, Wanapitei impact structure, Canada. Fig. 3. 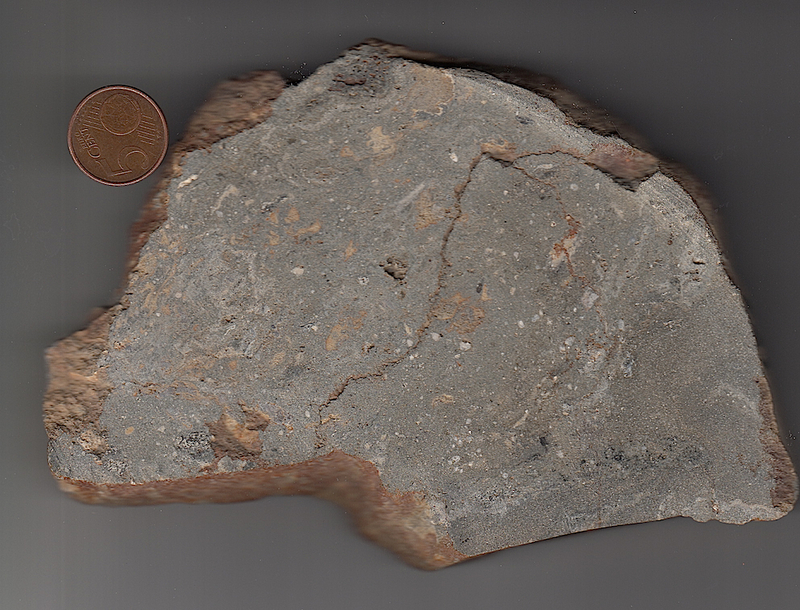 A polymictic breccia from the Azuara impact structure (Spain); near Herrera de los Navarros. 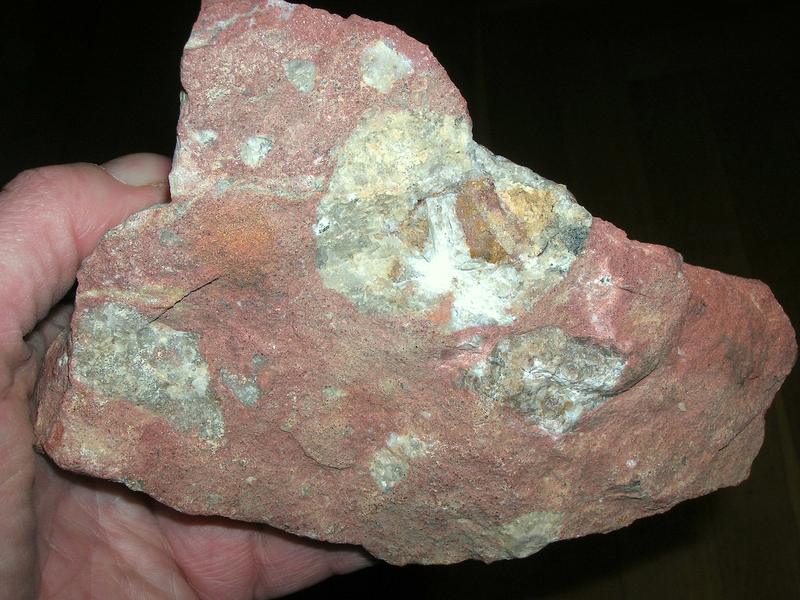 The reddish color of many limestone clasts is explained by enhanced temperatures. Fig. 5. 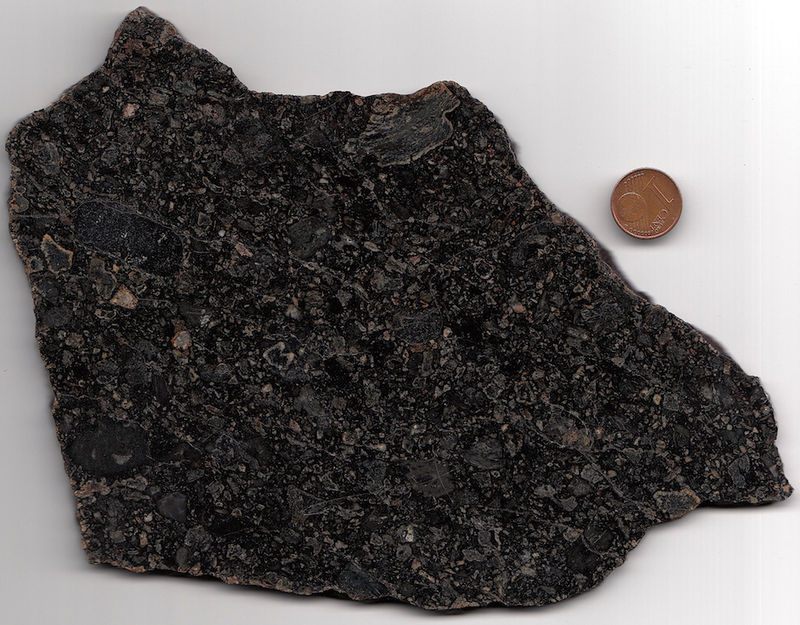 A polymictic matrix-rich breccia from the Tüttensee crater, Chiemgau impact strewn field, Germany. 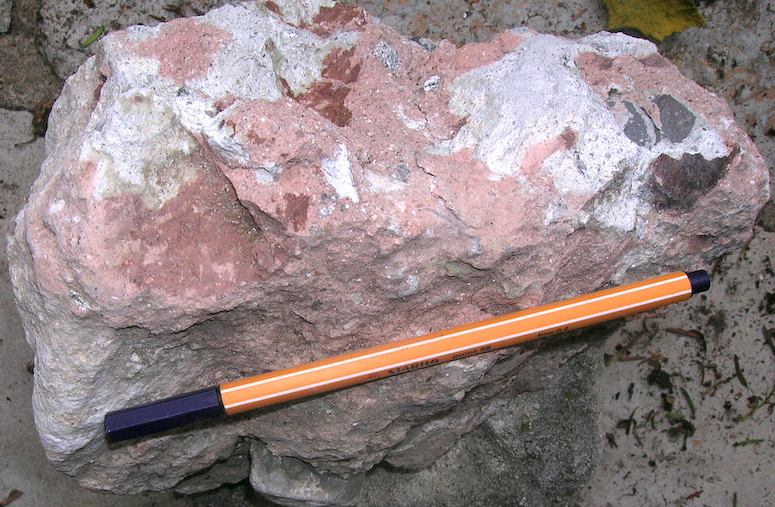 The breccia was excavated from the ejecta layer surrounding the 600 m-diameter Lake Tüttensee crater. Fig. 6. 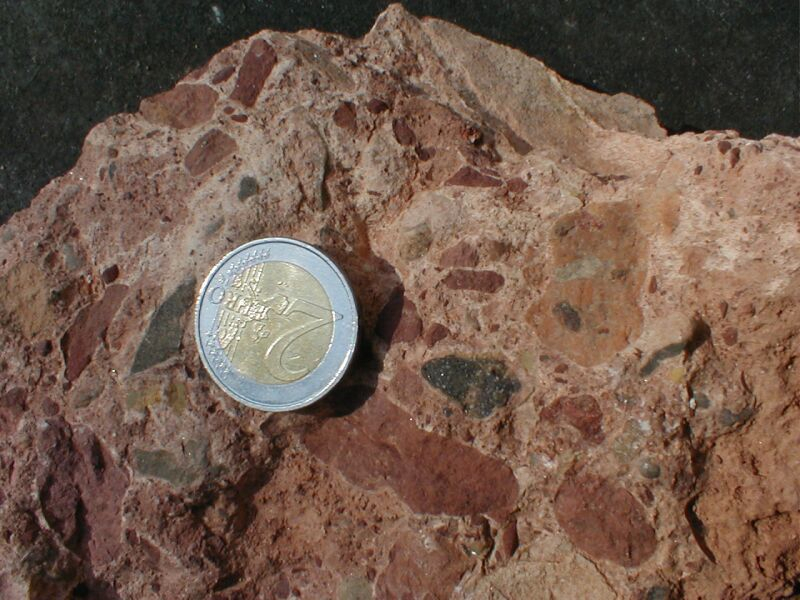 A polymictic breccia from the Rubielos de la Cérida impact structure (Spain); near Camañas. As in Figs. 2, 3 the reddish color of many limestone clasts is explained by enhanced temperatures. Also note the eddy-adjusted clasts. Sample courtesy of P. Bockstaller. Fig. 7. 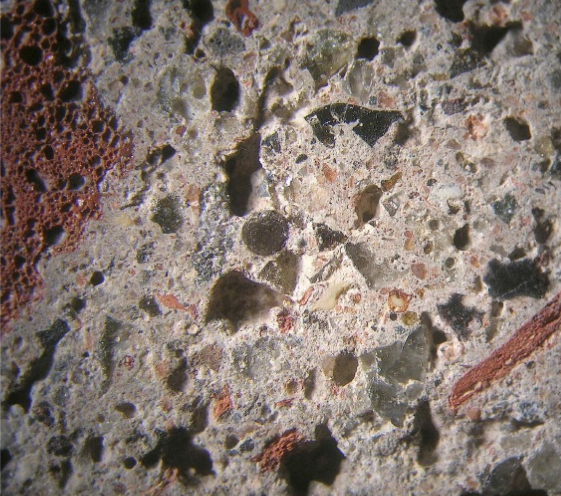 Matrix-rich polymictic impact breccia; Paasselkä impact structure, Finland. Fig. 8. Polymictic Bunte (multi-colored) breccia; Ries crater impact ejecta. 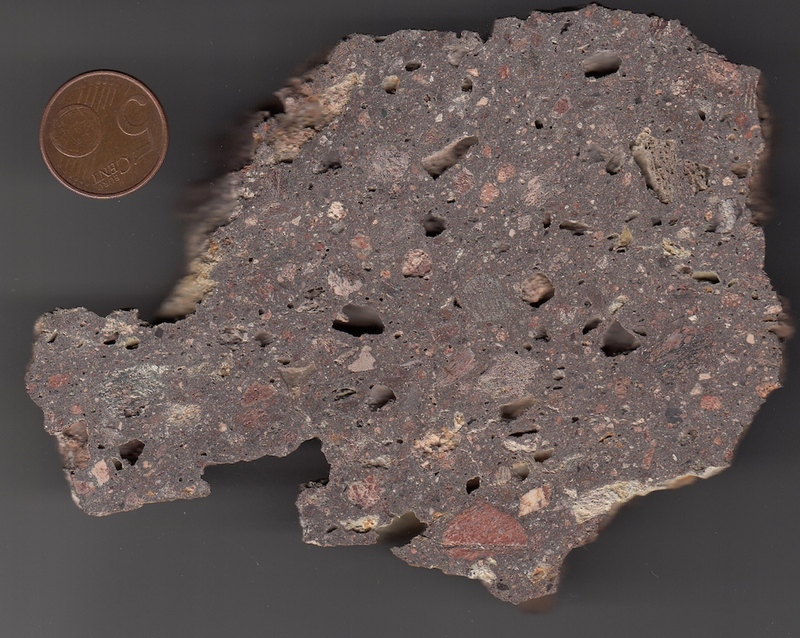 The Ries Bunte breccia together with the suevite deposits belongs to the best preserved impact ejecta surrounding the 25 km-diameter impact structure in an impressive blanket. Fig. 9. 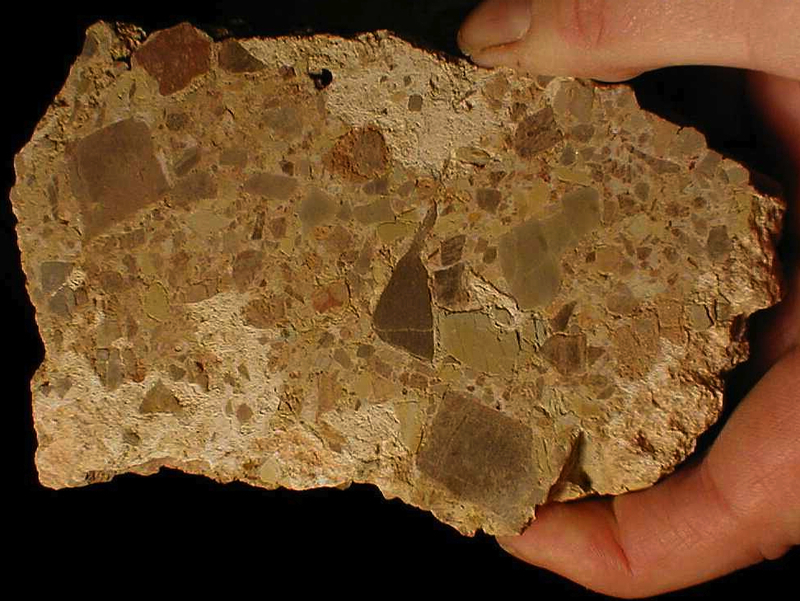 Due to the mixed crystalline – sedimentary target of the Ries impact structure the Bunte breccia ejecta are composed of both crystalline and sedimentary rocks, but the sedimentary component prevails. The breccia in Figs. 8, 9 consists mostly of Triassic Keuper sediments. Fig. 10. 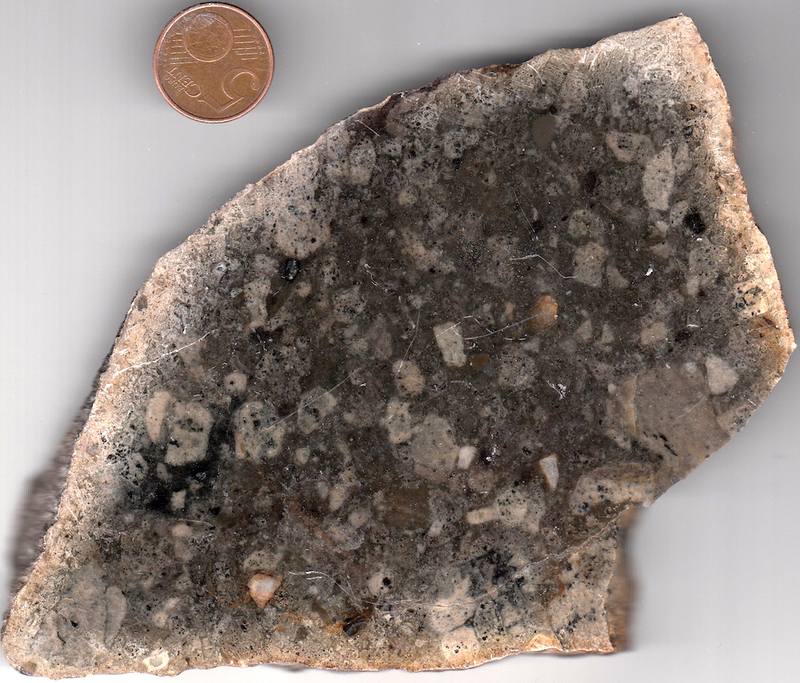 Polymictic breccia; Rochechouart impact structure, France. Fig. 10 -2. 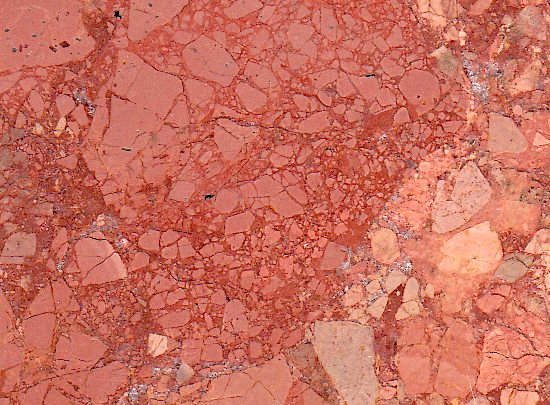 Close-up of the polymictic breccia in Fig. 10 -1. Most components are glass particles partly exhibiting spherulitic shape. (Image Müller 2011). Fig. 11. Polymictic impact breccia; Glover Bluff impact structure (Wisconsin, USA). Structure diameter 8 km, Cambrian age, or younger. In the extremely complex impact cratering process, breccias may incorporate earlier formed breccias, which leads to breccias-within-breccias and even to multiple breccia generations generally unknown from other geological processes. Fig. 13. 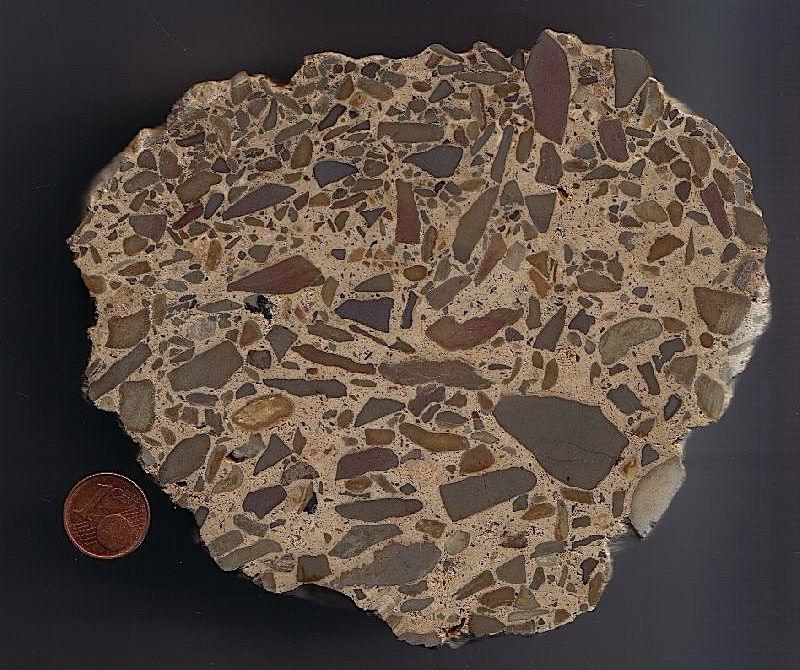 Breccia-within-breccia: polymictic breccia with flow texture and clasts being themselves brecciated (monomictic breccia). The distinct coherence of the monomictic breccia clasts proves high confining pressure during flow and emplacement of the polymictic breccia. Rim zone of the Rubielos de la Cérida impact basin, near Olalla. Fig. 14. 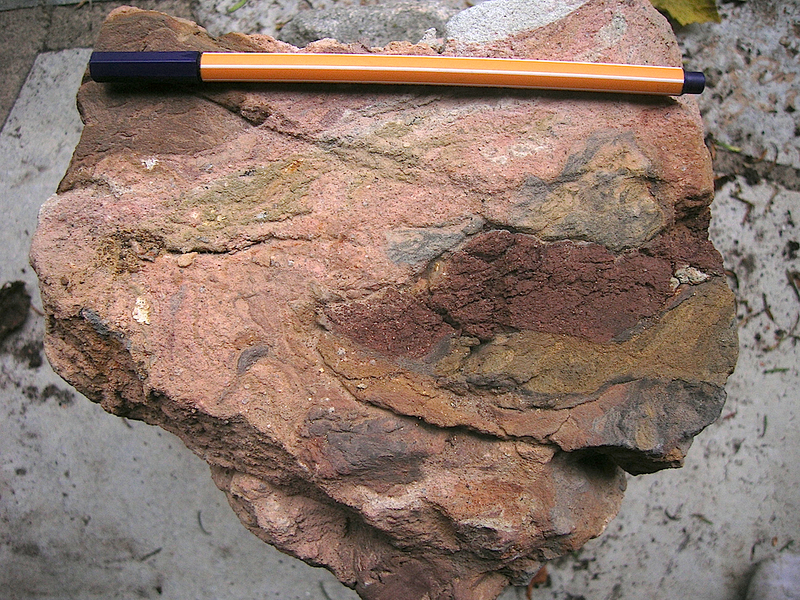 Polymictic breccia; Rubielos de la Cérida impact basin. 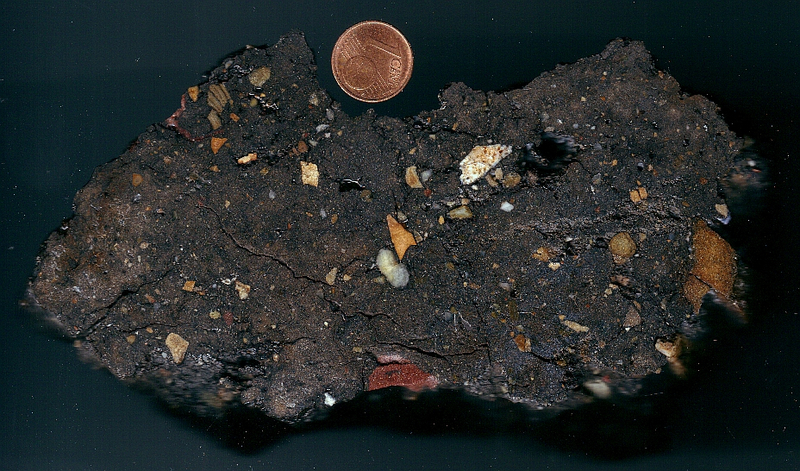 Note the clast to the right of the coin which itself is a polymictic breccia (breccia-within-breccia). Fig. 15. Polished slab of a polymictic limestone breccia, Azuara impact structure. 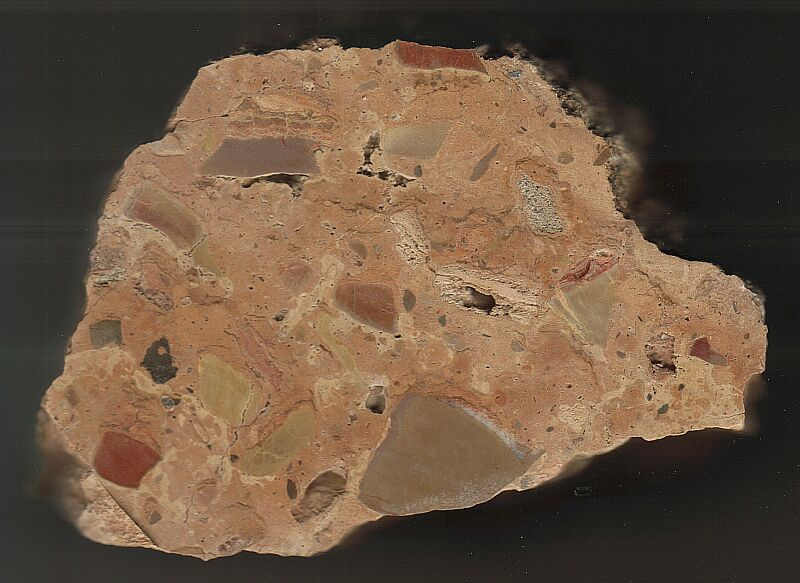 The breccia tells a complex story of formation. 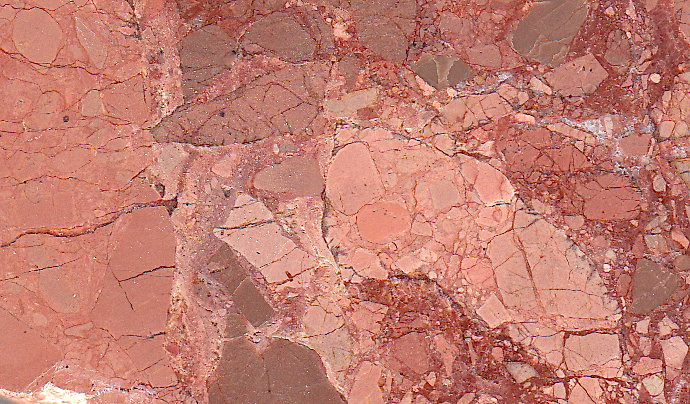 At least, four breccia generations can be observed (see close-ups below). Click on the image to enlarge this highlighting impact breccia. Fig. 16. Close-up of the breccia: monomictic and polymictic breccia clasts contributing to the polymictic multi-generations limestone breccia. Fig. 17. Detail of Fig. 15: Breccia generations.